So held New York’s highest court in a ruling today ordering the return of this Ancient gold antiquity to Germany. This was the second appeal to resolve the dispute over this small tablet. In an earlier probate proceeding, the estate was allowed to keep the tablet on the grounds that the German museum had waited too long to make its claim. The German claimant was the Vorderasiatisches Museum, a branch of the Pergamon in Berlin. Here’s the story of the tablet based on the court’s ruling. Its a 3,000-year-old gold tablet which dates to the 13th Century BCE. The tablet was found before the first World War by German archaeologists near the Ishtar temple in Ashur, Iraq. The tablet was in the inventory of a Berlin Museum starting in 1926. The Museum was closed during the second World War, and its collection was put in storage. But in 1945 the tablet was discovered to be missing. The tablet “resurfaced” in 2003 when its possessor, Riven Flamenbaum, passed away and his daughter and executor of his estate Hannah listed a “coin collection” in the accounting. But her brother Israel objected to the accounting and asserted that what he described as a “gold wafer” was an ancient Assyrian artifact and properly belonged to a German Museum. The court opinion is silent on how Flamenbaum may have acquired the tablet. The story according to the family was that the elder Flamenbaum, an Auschwitz holocaust survivor, acquired the tablet from a Russian soldier in exchange for cigarettes. Hannah Flamenbau is quoted by the AP with respect to her claim that “The thought was if we’re allowed to retain it, put it on display in one of the museums, whether down here in Battery Park City in Manhattan or even in Israel. Use it as a way to talk about the Holocaust … and my parents’ story”. The estate argued that it should retain the tablet because of the doctrine of laches, an equitable legal principle that essentially says it would be unjust to let a claimant wait this long to make a claim. However, the New York Court of Appeals held that though there may have been a delay, it was not unreasonable in light of the circumstances, and importantly no injustice would be done to the estate. Especially considering there was an indication that Flamenbaum knew the tablet rightfully belonged to a German museum. The other claim was that when Russia invaded Germany, Russia acquired artifacts like the tablet from Germany as spoils of war, and thus the German Museum could no longer hold good title. This legal argument conflicts with the steady stream of domestic and international principles of the last 150 years. You cannot invade a nation and strip it of its works of art. And so, this unlikely dispute which arose out of a dispute between siblings who lost their father results in the return of this gold tablet to Germany. In re Flamenbaum, 213 NY Slip Op 07510 (N.Y. 2013). 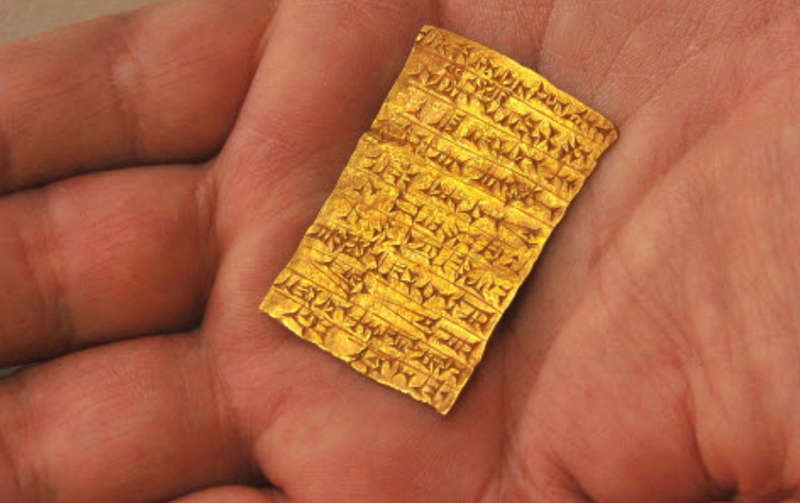 “Berlin Museum Seeks Return of Ancient Gold Tablet.” AP, October 15, 2013. Previous Previous post: Caesar asks ‘what is the value of stolen art’?